Coca-Cola is in talks with Canadian cannabis producer, Aurora Cannabis, about a deal to make marijuana-infused beverages, according to Bloomberg. Aurora’s shares surged on the news, jumping as much as 23% Monday on the New York Stock Exchange to $8. Coke’s stock climbed 0.72% to $46.32 on the New York Stock Exchange. Other stocks in the cannabis industry also got a boost, with Canadian cannabis firm Tilray adding as much as 9.4% in response to Coca-Cola’s interest. The prospective deal comes as Canada prepares for nationwide legalisation on October 17. As a growing number of US states move toward legalising marijuana and Canada prepares for full legalisation next month, more beverage companies are taking an interest in the cannabis market. Coke is far from the first beverage company to try to make green with cannabis producers — but it’s the first to do so in the soda category. The biggest investment the segment has ever seen came last month, when Constellation Brands invested $3.9-billion more in Canopy Growth. The move increases the beer giant’s ownership of the cannabis company to 38%, and vaults Constellation to the forefront of this up-and-coming segment. Diageo ​is also holding discussions with at least three Canadian cannabis producers about a possible deal. Similarly​, Molson Coors announced this month that it was forming a joint venture with Hydropothecary Corp and the former founder of Blue Moon Brewing Company launched CERIA Beverages, a new company with a line of cannabis-infused non-alcoholic craft drinks. Rather than market their marijuana-infused beverages as an alternative or complement to alcohol consumption, Coke may be focusing on developing a health-focused product made with CBD, a non-psychoactive cannibinoid that has been found to ease inflammation, muscle pain and cramping. The world’s largest beverage company has been contending with slumping sales in some of its core areas which have driven the company to look for profits in new places. For example, Coca-Cola recently moved into Japan’s “alcopop” market with the release of Lemon-Do, its first-ever alcoholic drink. Although the beverage will not come to the US, dipping its toe into new markets shows that the beverage giant isn’t afraid to take risks as it searches for new revenue growth. The cannabis market seems like a safe bet for the company. Estimates vary, but the consumer CBD market is estimated to grow to $2.1-billion by 2020, from $202-million in 2015, according to a recent report in the Hemp Business Journal cited by Forbes. 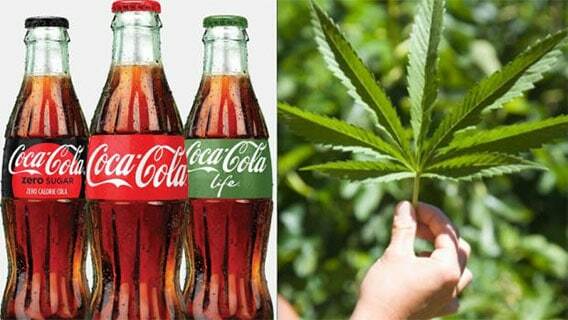 And while there is already a strong trend of beverage companies moving toward partnerships with marijuana growers, Coca-Cola is targeting an entirely different market with this potential deal. The brand’s experience in creating a variety of beverages gives it the advantage of having an extensive portfolio that it can draw from when creating marijuana-infused beverages. New lines of drinks could gear toward customers who seek the calming effects of marijuana without having to smoke, though Coke will need to market the product carefully to combat consumer stigma around marijuana and drug use. While there is still no guarantee the deal will go through, Bloomberg BNN reported that one source who has direct knowledge of the talks between the two companies said, “they’re pretty advanced down the path”. Although the US may have to wait a while before any CBD- or THC-infused beverages are widely sold stateside, the soon-to-be-legalided Canadian market could give the company time to perfect their products. When the US does fully legalise marijuana use — an event some believe to be right around the corner — companies such as Coca-Cola will find out whether these products will merely be a novelty or become a part of the mainstream.